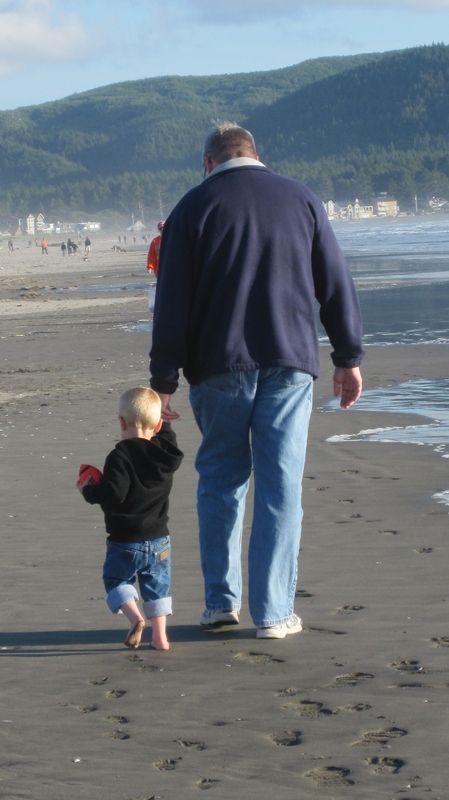 We are newly returned from a week of “Grandmapa Camp” with our kids and grandkids at the Oregon coast. The setting was beautiful and the company the best. I was concerned going into the week that absence would shroud our time as we all missed Becky. Instead, at least for me, it seemed that the week was all about presence . . . about family and permanence and the shaping of lives and the creating of memories that will continue to define family when Steve and I are gone. We were very aware of missing Becky and there were individual times of quiet and tears. But even more were the times of remembering, of telling stories, of noting resemblances to Becky, the sharing of things past and the affirming of her continued participation in family today. Becky wasn’t the only family member missed – we missed Jacob and Christopher too! But they were present in the missing and in the impact of their love and lives on the children. In subtle and not so subtle ways I can see in myself the legacy of the generations that came before me. I see my Mom and Dad at times – even in phrases passed down to my grandchildren – for instance “When it’s gone, it’s gone!” I see my grandmothers and grandfathers in various food preferences, phrases and natural bents that rise in me. In some vague but real way I am a collage of the men and women of the generations that came before me. And I see that same dynamic at work in the children of my children. They are a lovely blend of the families from whence they’ve come. What a joy to see this truth result in these resilient and beautiful young people. united in love, overcoming grief, growing together toward the next generation all in the compassing presence of the everlasting God. Praise Him! This entry was posted in Grief and tagged Becky, everlasting God, family, grandkids, Grandmapa Camp, Grandpa and Grandma Camp, legacy, permanence. Bookmark the permalink. Because of your choice (all of you!) to embrace life and hope and the continuance of tradition, you have a praise report instead of a sorrow report. It’s comforting to those of us around the perimeter who are concerned. I’m so glad to hear you had a GOOD week. Praise the Lord for your beautiful week! How great a gift it is for families to spend time together. 3 generations intertwined loving and learning from each other. It’s the best!!! So true! I miss them already, but what a blessing and joy to be together! Cindy – it was SO good . . . and so is God! Love you!